Motorcycle rider courses are not only important to help motorcyclists learn the skills required for the proper operation of a motorcycle, but they are also mandatory for some riders. Even if you already have your motorcycle license, a motorcycle rider course can help you to hone your skills and become a safer motorcyclist. Here are some things that you need to know about motorcycle rider courses in Iowa. The first thing you should know is that no matter who you are, a motorcycle rider course is important if you’ve never ridden a bike before. A motorcycle rider course will guide you through all of the basics about motorcycle operation, and help you fine-tune certain skills—like how to safely turn and brake—that are invaluable. Who Must Take a Motorcycle Rider Course? Iowa law does not require all motorcyclists to take a motorcycle safety course; rather, only those people ages 17 and under who want to obtain a valid motorcycle license must take the course. Your license won't be issued until you complete the course. While there is no requirement for older first-time riders, taking a motorcycle safety course is highly recommended. Any person who is over the age of 13 can take the motorcycle rider course to refresh or improve upon riding skills. There are two separate rider courses that you can choose from depending upon your ability level. The RRBRC, or returning rider basic rider course, is designed for those who have the necessary skills, but haven’t ridden in a while. This course is only open to bikers who are 18 years of age or older and is a one-day class for eight hours. The other course is the BRC, or basic rider course. The basic course is what all first-time riders should take. If you take the course through American Bikers Aimed Toward Education (ABATE), then your motorcycle is provided, as well as eyewear and a helmet if you don't already have them. The instructors can show you how to know your motorcycle helmet fits properly and point you to the Department of Transportation (DOT) and Snell Memorial Foundation approved helmets. The course is 15 hours in length over the course of multiple days, plus a three-hour pre-course e-course. There is also a BRC II, which has a minimum of five hours spent on the range. While a $2.00 fee for each motorcycle registration validation each year supports motorcycle rider courses in part, there are some additional out-of-pocket costs. Depending upon the course sponsor, you may end up paying between approximately $115 and $245 for your motorcycle rider course. While the cost may seem expensive up front, remember that learning safety skills now may save you hundreds, or thousands, of dollars in the future. As a note, the returning rider basic rider course, when taken from ABATE, only costs $75. 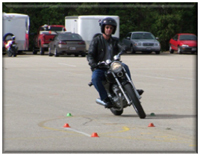 Most motorcycle rider safety courses are available from April through October. What’s more, there are multiple locations throughout the state, and it’s likely that there’s one near you. From Algona to Sioux City, all 15 community colleges in Iowa teach a motorcycle rider course. There are also motorcycle rider classes offered through the following groups/businesses. Does Taking a Rider Safety Course Affect My Liability In an Accident? 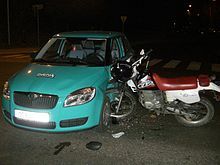 If you are riding a bike without a license at the time of a motorcycle accident, then you may be held partially to blame for the crash. Bikers might see reduced insurance money based on the premise that they were riding illegally and without proper experience, which is negligent. However, more than affecting liability after an accident, attending a motorcycle class can help you to ensure that you have the skills necessary to prevent an accident from occurring in the first place. Walker, Billingsley & Bair supports bikers and consistently write blogs on motorcycle accidents, laws, and safety tips for our motorcyclist friends and clients.